German police say they have found a "significant clue" in an apartment belonging to A320 Co-Pilot Andreas Lubitz, who is suspected of intentionally crashing a jet with 150 people into Alpine terrain; the unspecified item is not a suicide note, they say. After a four-hour search of Lubitz's flat, which he is said to have shared with a girlfriend, German police say they have found a "significant clue". Officers refused to specify what exactly was discovered, but say it was not a suicide note. The item would be send for testing and police hope it might offer some explanation. Law enforcement in the town of Montabaur, near the German city of Bonn, were searching the home of Andreas Lubitz for evidence that might explain why the co-pilot allegedly intentionally crashed Germanwings flight 9525 into an Alpine mountain, killing all 150 people on board, including himself. Lubitz was believed to split his time between two addresses. Apart from the above property, another one is believed to be a house that he shared with his parents in the same town. German detectives were also seen carrying evidence from this property — large blue bags and a computer. According to French prosecutors, Lubitz is believed to have barricaded himself alone in the cockpit of Germanwings flight 9525 and apparently set it on course to crash into an Alpine mountain. Audio from the cockpit voice recorder revealed that the captain had left the cockpit to use the restroom, according to prosecutors, and could not get back in. The captain used an axe to try and force his way back in, German daily Bild said Friday, quoting security sources. The cockpit flight recorder showed that the captain repeatedly knocked and tried to get back in as the plane went into its fatal descent. A spokesman for Germanwings confirmed to AFP that an axe was on board the aircraft as such a tool is part of the safety equipment of an A320. Reinforced doors spread to major airlines around the world in the wake of the Sept. 11, 2001, terrorist attacks. According to the aircraft manual, the Airbus 320 cockpit door has three positions: unlocked, normal and locked. The door would usually be in the normal position, but according to the reports, it would appear that after the captain left the cockpit, it was switched to the locked position. Doing so prevents the other pilot from using a keypad and emergency code to get in. All US carriers must have two people on the flight deck at all times. Any pilot leaving the flight deck must be replaced by a flight attendant for the time of his abscence. Lufthansa, the corporate parent of the low-cost Germanwings, does not have a rule against a lone pilot. Now numerous mass media reports suggest that Lubitz might have suffered from depression. He took a six-month leave from training back in 2009 because he felt "burnt out". 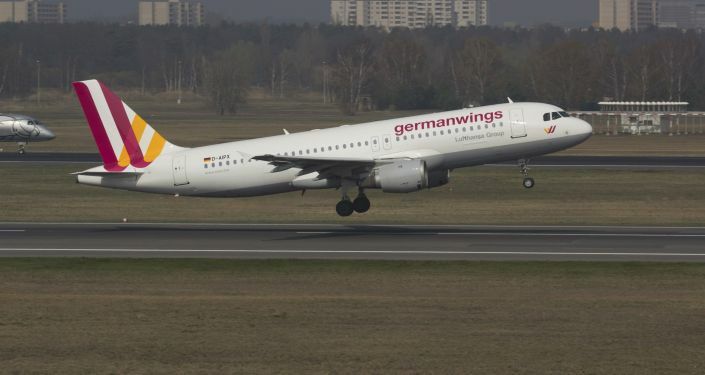 Germanwings Flight 9525 was a scheduled international passenger flight from Barcelona to Düsseldorf operated by Germanwings, a low-cost airline owned by Lufthansa. On March 24, 2015 the aircraft, an Airbus A320-200, crashed 100 kilometers northwest of Nice, in the French Alps, after a constant descent that began one minute after the last routine contact with air traffic control and shortly after the plane had reached its assigned cruise altitude.